The documentation contains All Panel documentation for All Macro Panels. 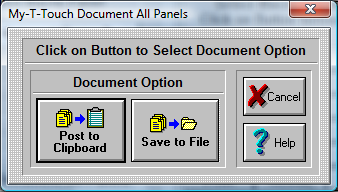 Click on this button to Post the All Panel Documentation onto the Windows Clipboard. You may then paste the textual information into any word processor, or other application that uses text. This will open the File Save Dialog which will allow you to save All the textual Panel Documentation to a file & save the information to disk. Press the CANCEL button to Close the Dialog & cancel the documentation operation.